Let's listen to the melody. This simple, empire-waist jumper designed especially for beginning sewists can be worn alone or layered over a blouse or shirt in cooler weather. View A presents a softly pleated, mid-calf-length skirt, while View B gives an A-line skirt with a single, inverted box pleat at center back. Both views button up the back. Share your photos on Instagram with the hashtags #musicboxjumper and #oliverands. Girl's dress. Simple empire-waist jumper designed especially for beginning sewists can be worn alone or layered over a blouse or shirt in cooler weather. View A presents a softly pleated, mid-calf-length skirt. 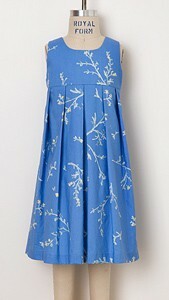 View B gives an A-line skirt with a single, inverted box pleat at center front and a decorative button tab detail. Both views button up the back. 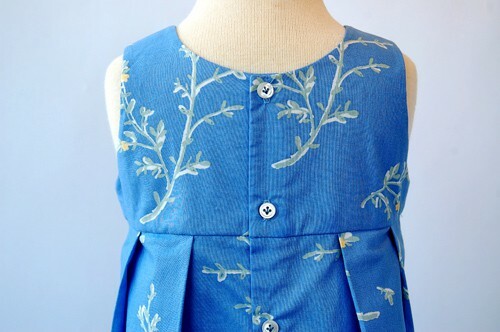 After successfully sewing this pattern, you will have developed the following skills: buttonholes, plackets, and pleats. Lightweight fabrics like quilting cotton; cotton chambray, fine twill, shirting, and fine-wale corduroy; and light- to medium-weight linen. Coordinating thread, lightweight fusible interfacing, 1/2" buttons or snaps (six for View A, eight for View B). Chest 20 3/4" 21 3/4" 22 3/4" 23 3/4" 24 3/4" 25 3/4"
Length, View A* 20 1/4" 21 1/2" 22 3/4" 23 3/4" 25" 26 1/4"
Length, View B* 18 1/4" 19 1/2" 20 3/4" 21 3/4" 23" 24 1/4"
Chest 26 3/4" 27 3/4" 29 1/4" 30 1/4" 31 3/4" 32 3/4"
Length, View A* 27 3/4" 29 1/4" 31" 32 1/2" 34" 35 3/4"
Length, View B* 25 3/4" 27 1/4" 29" 30 1/2" 32" 33 3/4"
I bought this pattern so I could make my daughter a uniform jumper that was similar to the pointe style jumper that is popular. It was easy to modify the back to eliminate the buttons since I wasn't sure that would be comfortable for sitting in school. It came out absolutely adorable and was very easy to sew. This was my first Oliver+S pattern. Went together very well. Good instructions. My granddaughter loves her jumper! Made "A" as an Easter dress for my 10-year-old daughter. She LOVED it. I am thrilled with the option to order a digital version (I couldn't find anything close from a local shop) as I was able to jump right into sewing instead of driving around / waiting for shipping. I made view B in a red pinwale corduroy and used a festive holiday fabric for the button flaps. It fits my granddaughter like a glove and could not be cuter! It was a joy to make as the directions were clear and straightforward and the pattern a simple but classic one. As always, Oliver + S exceeds expectations. Excellent directions, beautiful finish, spot on sizing. Living in the UK, digital is a boon. Love the pattern, have made version A and am planning on making version B. Instead of buttons down the back, am thinking along the lines of buttons on the shoulder. Has anyone tried this ? 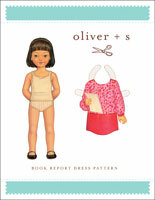 I love every single Oliver + S pattern I've ever sewn, and this one is no exception! Great finish, great instructions, and perfect fit! This is my second Oliver & S pattern and I'm again blown away by how great these patterns are! True to size, amazingly clear instructions, and the pieces come together more precisely than any other pattern brand I've used. I did alter this one a bit - I dropped the neckline in the back a smidge and skipped the buttons altogether - my daughter can just pull it over her head. I made this in 100% cotton quilting fabric, and I'll definitely have to iron it to keep the pleat crisp - the next time, I'll choose an apparel fabric. I'll make this one again and again. Thanks for another great pattern! This pattern is a great beginner pattern with a high quality finish! It turned out great and I plan to make more. I just finished this jumper with the pleats! It was easy to make. The only thing I changed was the direction in which I pressed the pleats. I did the box pleat in the center and wanted the other pleats to fold to the sides. I plan on making the other version in a Thanksgiving fabric from my granddaughter . I bought this lovely classic pattern to make for my grand-daughter and I love it because it can be for any season depending on the fabric used. All the Oliver + S patterns I've tried so far, have turned out beautifully. I order this pattern in the larger size. I made the jumper for my granddaughter several times in the smaller size. It is classic and versatile. I have a print pink corduroy planned for kindergarten Will post when finished. Your patterns are the best. I am working on a purple corduroy red riding hood cape now. 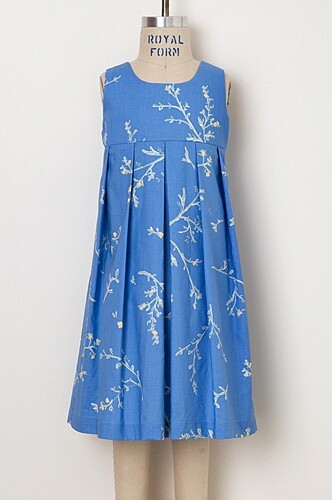 I bought this pattern to make this dress as a gift. The instructions are very clear and the dress was easy to make. I have bought several more patterns since purchasing this one. I'm not sure this is my favorite pattern I've ever sewn of O + S. It turned out beautifully, but I had some hiccups along with way and I'm not sure how much of it was my rusty sewing skills or just pattern directions. I had some problems understanding the layout of the pleats (which was odd because I've made other skirts with these kinds of pleats and I struggled some with the bodice - attaching it to the skirt and also how to layout the buttons with the bodice etc. (I ended up folding my bodice for the button facing, but I don't think that was correct. In the end, I do love this jumper and so does my chick, but I wouldn't say it's my fav pattern. I have been sewing for years......first for my own four daughters now for my two granddaughters. I am thrilled with your patterns. The "music box jumper went together perfectly, and I also downloaded the "Sunday brunch jacket and skirt" which also went together beautifully. 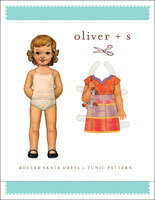 I now will only use Oliver +s patterns. They are far superior to what is in the regular old pattern books! Thank you for a great product! Finally, instructions that make sense! 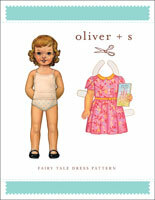 I love all the Oliver + S patterns. But of all the ones I've made, THIS is my absolute favorite. I've used it from the time my granddaughter was in a size 2T to this last Christmas when I made a size 7. I used cotton black velveteen and paired it with a blouse I made from the Music Box Blouse and Skirt pattern. Beautiful! Note that in the first printing of the paper version of this pattern, the first two illustrations on page 2 of the instructions showed notches under the arms. These notches were not included in the final version of the pattern as they were not necessary, so you will not find them on the pattern sheet. Revised illustrations without the nothces are show here. This error has been corrected in the digital version of the pattern that is available now. Note that in the first printing of the paper version of this pattern, there is an error on piece #5, the Front Skirt (View B). The pleat placement line and notches for the pleat placement line should not have been graded for the various sizes, but should instead be consistent for all the sizes. For the large sizes (5-12) draw a new pleat line 1 7/8" from the center fold line and use that line instead of the provided pleat lines. 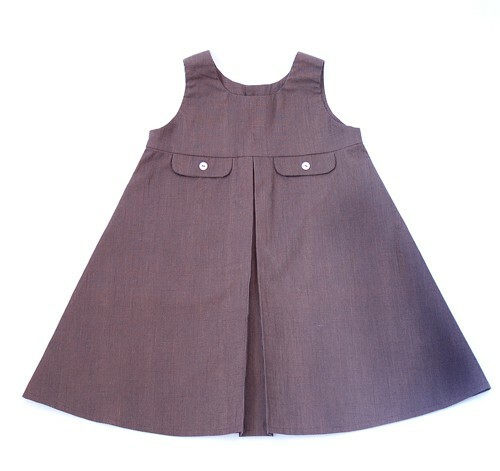 For the small sizes (6M-4), use the size 2T pleat line for all sizes. This error has been corrected in the digital version of the pattern that is available now. Discussion on the digital music box jumper sewing pattern from the Oliver + S Discussion Forums. Find and share more photos on Instagram using the hashtags #musicboxjumper and #oliverands.